How to get your cross-channel marketing strategy right? Succeeding in the multi-channel flurry is difficult unless planned to perfection. Here are a few strategic insights that would be helpful for corporates eager to make a viable campaign. “Good marketers see consumers as complete human beings with all the dimensions real people have,” says author and entrepreneur, Jonah Sachs, interpreting the modern marketing approach that creates a 360 degree perspective, using a surfeit of accurate options to deliver content and understand a customer. Welcome to the age of cross-channel marketing. By definition, cross-channel marketing is the practice of using multiple channels to reach customers and making it easy for them to use (and convert) whatever medium they are most comfortable with. The user gets the option to interact with the brand through several channels including retail stores, PPCs, a modern and functional website, direct mailers, emails, mail order catalogue and the ubiquitous mobile platform. The seamless nature of such variety also means that you could reach any customer, anywhere. Thus, a user gets more touchpoints which in turn give a company more data about the pattern of usage and tips to improve its promotions. This steadies the perception of consistency of the brand across channels, leading to more gratification among the users. 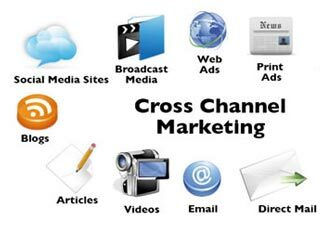 The advantage of having so many channels also means managing cross-promotions through an integrated marketing approach. A study by International Data Corporation (IDC) says that customers who shop in stores as well as online are highly valuable for a company, underlining the theory that cross-channel marketing in the retail business is a strategic competitive advantage. Therefore, if you treat a channel as a distinct entity (thus breaking the consistency maintained across), you can alienate a customer from the brand. Succeeding in the multi-channel flurry is difficult unless planned to perfection. Challenges are optimization of budget, content and delivery channels, accurate measurements for course correction, selection of absolute channels and interfaces for customer attention and satisfaction, personalization for a fuller experience and use of the right technology for customer ease and retention as easier said than done. Thus, few strategic insights would be helpful for corporates eager to make a viable campaign. According to surveys, most of the customers prefer an integrated marketing approach which means as the choice of cross-channel marketing avenues grows further, companies must engage their customers in more meaningful conversations on any device, touchpoint or channel hence the need for an optimal, multi-channel marketing campaign. This is more so because multi-channel customers spend much more than single-channel customers. A Gartner study says basic campaign management, advanced analytic and execution competencies (including loyalty management, content management, event triggering, etc) as well as strong digital marketing skills are essential capabilities to succeed. In the presence scenario, digital marketing also extends the process through point-of-sale terminals, interactive TV, and digital signage and kiosks besides basic paths. Visibility is the strategic requirement for cross-channel marketing as data shows that majority of the customers move around before buying. Hence, is imperative to coordinate the marketing effort across different channels using a cohesive strategy, aimed at bringing potential customers towards engagement and then ‘pushing them further down the funnel’. For this, some channels can work better in a combination such as computer/mobile, TV/mobile, computer/TV, radio/mobile and computer/radio. Of these, surveys show that computer/mobile is the most popular during work hours (9am – 5pm) while TV and mobile are ideal after work hours. Optimization of the marketing strategy is the next step; besides some smart budgeting to ensure the visibility quotient (thus, the choice of right channels is key), the campaigns must be well tuned to utilize the mediums chosen, having suitably adapted the deliverable content. Personalization is central to the customer attention and retention. The focal point of every campaign must be customer lifecycle and consistency. Customers prefer companies that address them in a personalized, direct way. A brand must be able to deeply analyze each customer’s unique transactional history gathered from several interaction points. An optimized message with a motivating content for each device is key for meaningful customer experience. Ditto for well-choreographed campaigns; marketers must anticipate and develop highly orchestrated touch points and micro-campaigns that fit multiple channels well. However, a recent survey by Experian cites the lack of accurate data and therefore the precise insight (into the offline and online impact on customers of every single one of your channels, platforms, and landing pages) as the biggest challenge to personalization. Often the silo approach or several departments within an organization working in isolation and not sharing useful and actionable data with others is a reason for the cross-marketing efforts to fail. Thus, cross-promotional efforts must be integrated with overall marketing. Many CMOs consider lack of accurate measurements on multiple customer touch points as an impediment to a progressive and effective cross-channel marketing strategy. Gauging the efficacy of campaigns can be done through few predefined set of tools or perspectives that would assess a customer’s initial interface with a brand to his final purchase, thereby giving valuable insights on landing pages to customer expectations from your brand. Another cue to marketers would what experts call `response attribution’ – though it may be difficult to gauge which channels and campaigns contributed more for the conversions or sales, companies can measure what triggered each response – thus identifying the success of each effort. A corporation can also set up management centres that could check and correct the effectiveness of its multichannel marketing efforts. Such a task centre can co-ordinate for data compiled from multiple channels and numerous touch points for future marketing efforts. With such data, information such as - what channels work best for your business and where does the key audience spend most of their time – is highly critical for a more focused approach (Forrester says as low as 12% of the business data is used for analysis). Key to success here is to create and maintain a single view of the customer across all platforms thereby enhancing a consistent customer experience at every step. However, having data from several sources is good but unless you learn what to do with it, it remains mere pointers. The true accomplishment of your cross-channel marketing efforts can be assessed when a customer evolves and changes along with your experiences. The data will keep changing but customer experience will only get improved if it is delivered with quality and consistency. This is that point of the marketing journey when your customer feels the brand in its wholesomeness and spirit, regardless of their point of contact.